Writing attractive job descriptions can be a hard thing for many employers. After all, most HR folks weren’t trained in writing great prose. But some employers definitely stand out when it comes to creating job ads that are inviting and tell a story. Main-Land in Livermore Falls, ME is one of those employers. 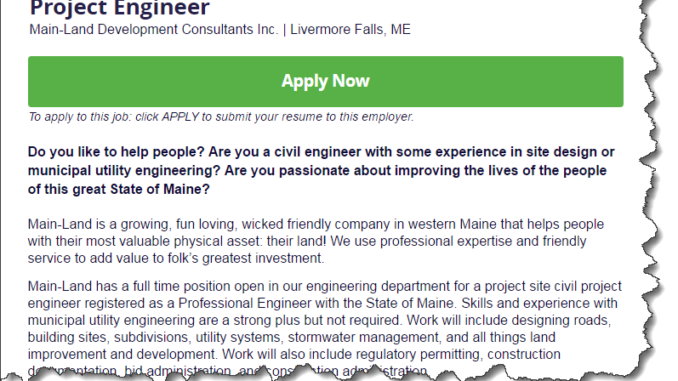 Their recent posting on JobsinME for a Project Engineer caught our eye for its creativity. So we’d like to break down why we think it’s a great ad. They open the ad with a series of questions to help filter out the right person immediately. Do you like to help people? Are you a civil engineer with some experience in site design or municipal utility engineering? Are you passionate about improving the lives of the people of this great State of Maine? Then they go right into selling their company as a great place to work by using keywords like “fun loving” and “wicked-friendly” which help set the right tone and get the candidate excited. Main-Land is a growing, fun loving, wicked friendly company in western Maine that helps people with their most valuable physical asset: their land! We use professional expertise and friendly service to add value to folk’s greatest investment. They list the hours and talk about pay, something most companies don’t do. They list detailed instructions on how to apply. It also makes the apply process more interesting. So kudos to whoever at Main-Land wrote this, we here at JobsInTheUS applaud the effort.